In Pennsylvania, there were approximately 355 traffic crashes each day (about 15 crashes every hour). An average of three people died in crashes every day (one fatality every seven hours). Approximately 227 people were injured in crashes every day (about nine injuries every hour). 2016 had the lowest number of motor vehicle crash fatalities in Pennsylvania over the last 86 years. The vast majority of crashes occurred under no adverse conditions. The highest number of crashes occurred in December (12,409), while the highest number of fatalities occurred in June (120). Death or injury occurred in 44 percent of PA work zone crashes in 2016. During the first six months of 2015, 552 people were killed in car accidents in Pennsylvania. An estimated 18,630 people will be killed in car accidents in 2015 nationwide, a 14 percent rise from 2014. In 2015, 36 states reported an increase in car accident injuries over six-month totals. In the United States, injuries for the first six months of 2015 are estimated to be about 2.25 million, a 30 percent increase from 2014. In PA, there were 121,317 reportable traffic crashes, 1,195 of these accidents were fatal. The 2014 number of reported accidents decreased 2.3 percent compared to the number of accidents in 2013, and deaths decreased by 1.1 percent. The 2014 number of accidents is the fourth lowest since 1951. The 2014 fatality rate per miles traveled was the second lowest since 1935. Traffic collisions caused each man, woman, and child in Pennsylvania an estimated economic loss of $1,083. Each day, 219 people were injured in reportable crashes (about nine injuries every hour). More crashes involved a vehicle hitting a fixed object than any other crash type (38,553). This crash type also caused the most deaths (425). The crash type that caused the second-highest amount of fatalities involved the driver being struck from an angle. Passenger cars were the most common vehicle involved in crashes. Light trucks, vans, and SUVs were second. Male drivers are involved in more crashes than female drivers, specifically male drivers ages 21 to 25. The majority of crashes occurred under no adverse weather conditions (95,132). Rain or fog caused 13,870 crashes, resulting in 115 deaths. Snow/sleet/freezing rain contributed to 10,236 crashes, resulting in 44 deaths. Tire and wheel-related defects caused 861 crashes, while brake-related defects caused 707 crashes. Moe than 45 percent of work zone crashes in 2014 involved fatalities and injuries. There were 1,845 total crashes occurring in work zones that injured 1,241 and killed 24. In 2014, the most crashes occurred on a state highway (79,250). The most crashes happened in the month of January (12,756), while the most deaths happened in the month of August (130). The higher volume during rush-hour period is a large contributing factor to vehicle crashes. The most crashes occurred during the holiday period of pre-Thanksgiving. The highest contributing factor to fatalities was speeding, and the second was drunk driving. More than 330 people died in alcohol-related crashes in 2014. On average, 29 alcohol-related crashes occurred each day. In 2014, alcohol-related crashes decreased to 10,550 from 11,041 alcohol-related crashes in 2013. 13 percent of driver deaths in the 16-20 age group were drinking drivers. 43 percent of driver deaths in the 21-25 age group were drinking drivers. Three out of four crashes occur within 25 miles of a person's home. It was found that if car occupants used seatbelts 100 percent of the time, not only would there have been 201 fewer deaths, but every man, woman, and child in Pennsylvania would have had an economic savings of $148. There were 124,149 reportable traffic crashes, 1,208 of these accidents were fatal. The 2013 number of accidents is the fifth lowest since 1951. The fatality rate is the second lowest since 1935. Traffic collisions caused each man, woman, and child in PA an estimated economic loss of $1,099. Each day, 228 people were injured in reportable crashes (about 9 injuries per hour). The crash type that caused the most deaths (468) involved the driver hitting a fixed object. The second most fatal crash type, resulting in 245 deaths, involved the driver being struck from an angle. 256 deaths were caused by the driver crashing into a tree, while 139 deaths were the result of the driver hitting an embankment. Passenger cars accounted for the most common vehicle involved in crashes, while light trucks, vans, and SUVs fell second. Male drivers ages 21-25 were involved in more crashes than any other age group (17,015). The highest contributing factor to fatal crashes was speeding. 381 people died in alcohol related crashes in 2013. On average, 30 alcohol-related traffic accidents occurred each day. Alcohol related crashes decreased from 11,956 in 2012 to 11,041 in 2013. 19 percent of driver deaths in the 16-20 age group were drinking drivers. 44 percent of driver deaths in the 21-25 age group were drinking drivers. The majority of crashes occurred under no adverse weather or road surface conditions. Rain and fog contributed to 14,460 crashes, resulting in 116 deaths. Snow/Sleet/freezing rain contributed to 11,628 crashes, resulting in 59 deaths. Tire and wheel-related defects caused 912 crashes, while brake-related defects caused 757. There were 1,845 crashes in work zones, injuring 1,262 and killing 16. Most crashes—80,830 of them—occurred on a state highway. The most deaths happened in the month of August (125). The most deaths happened around 4 p.m. The most crashes occurred during the holiday period of post-Thanksgiving. It was found that if car occupants used seatbelts 100 percent of the time, not only would there have been 238 fewer deaths, but every man, woman, and child in Pennsylvania would have had an economic savings of $173. In 2012, there were 124,092 auto accidents reported in Pennsylvania. Approximately 87,846 people were injured in Pennsylvania accidents in 2012. 1,310 people were killed, which is the third-lowest number of deaths over the past 68 years (but was an increase from 2011). One out of 44 people were involved in a car accident in 2012. One out of 9,743 people were killed in a car accident in 2012. One out of 147 people were injured in a car accident in 2012. There were 168 pedestrians killed and 4,548 injured in car accidents in 2012. There were 210 motorcyclists killed and 3,919 injured in motorcycle accidents in 2012. There were 16 bicyclist deaths and 1,377 injured in accidents in 2012. There were 159 deaths in truck accidents. Traffic collisions cost every man, woman, and child in Pennsylvania was $1,164 in 2012. Head-on crashes (4,315) caused 129 deaths in 2012. There were 7,033 crashes in 2012 that involved one vehicle sideswiping another. Drivers ages 21-25 represented the largest number of people involved in accidents. Drivers ages 16-20 had the second-largest number. Ice and ice patches contributed to 2,684 crashes and 17 deaths in Pennsylvania in 2012. Brake-related defects contributed to 847 crashes in 2012. There were 1,661 accidents in work-zones in Pennsylvania in 2012 — 21 were killed (including three workers) and 1,124 were injured. The most crashes occurred in December (12,3289), but the most fatal collisions occurred in June (131 deaths). More crashes occurred on Friday than any other day of the week (20,313), but the most fatal crashes occurred on Saturday (237 deaths). The highest number of crashes occurred between 3 and 5 p.m. The most fatal crashes occurred at 3 p.m. Drinking drivers contributed to 10,941 crashes, including 217 fatal crashes in Pennsylvania in 2012. Drowsy drivers contributed to 2,673 crashes, including 24 fatal crashes. Distracted drivers were the second-most common factor that contributed to accidents. Speed was the most common factor. There were 404 alcohol-related deaths, which is a decrease from 2011. Alcohol-related crashes increased to 11,956 in 2012. Approximately 18 percent of the driver deaths in people ages 16-20 were drinking drivers. Of drivers ages 21-25 killed in accidents, 40 percent were drinking drivers. In 2012, alcohol-related deaths decreased from 428 to 404 in 2012. Three-fourths of the drinking drivers in traffic crashes were males. Each day on average, there were 33 alcohol-related crashes. About 24 people were injured every day in 2012 in accidents in Pennsylvania. Alcohol-related accidents represented 31 percent of all traffic collisions. Over half of the fatal accidents that involved alcohol (52 percent) occurred on Saturday and Sunday. There were 954 crashes involving underage drinking drivers in 2012. Of the total traffic collision deaths, 56.4% involved passengers or drivers who weren't wearing seat belts. The counties with the most reported traffic crashes in 2012 were: Allegheny (9.8 percent), Philadelphia (9.1 percent), Montgomery (6.8 percent), Bucks (4.8 percent), Lancaster (4.2 percent), Berks (3.8 percent), Lehigh (3.7 percent), Delaware (3.7 percent), York (3.6 percent), and Chester (3.5 percent). The counties with the most traffic-related deaths in 2012 were: Philadelphia (8.2 percent), Allegheny (5.1 percent), Bucks (5 percent), Westmoreland (4.2 percent), Berks (3.8 percent), Lancaster (3.6 percent), Montgomery (3.4 percent), Lehigh (3.2 percent), Luzerne (2.7 percent), and Schuylkill (2.5 percent). 33,561 people died in motor vehicle in 2012 - the first increase in traffic fatalities since 1995 and a 5.3 percent increase in fatalities according to the National Highway Traffic Safety Administration. According to the National Transportation Safety Board (NTSB), wrong-way drivers kill nearly 400 people every year. According to the NTSB, 15 percent of wrong-way crashes involve drivers older than 70 years old. About 22 percent of wrong-way crashes are fatal, compared with less than 1 percent of all other crashes. Drunk drivers cause 60 percent of wrong-way crashes. Nearly 10 percent of those accidents are done by repeat offenders. The number of fatal car accidents in Pennsylvania dropped 2.5 percent in 2011 - from 1,324 to 1,291. This drop is the second-lowest number that has been recorded in history, second only to 2009. Drunk driving fatalities also decreased. There were 379 fatalities in 2011 -- the lowest in over 10 years. Motorcycle-accident related fatalities decreased from 223 to 198. Fatalities involving drivers who hit trees decreased from 295 in 2010 to 250 in 2011. Deaths resulting from cross-median crashes decreased significantly -- from 84 in 2010 to 48 in 2011. Head-on crash fatalities fell to 158 as well. Of the estimated 5,338,000 police-reported traffic accidents, there were 32,367 traffic-related fatalities, which is a 2 percent decrease from 2010. There were an estimated 2,217,000 traffic-related injuries, which is a 1 percent decrease from 2010. On average, 89 people died each day in motor vehicle accidents, which is approximately one person every 16 minutes. Motor vehicle crashes were the leading cause of death for age 4 and every age 11 through 27. 4 percent of all traffic fatalities were ages 14 and under. Seat belts saved the lives of 11,949 people. If all occupants younger than 5 would have worn seat belts, an additional 3,384 lives would have been saved. 29 percent of those killed in car accidents were not wearing seat belts. Speed was a factor in 30 percent of all fatal crashes. Young male drivers were the most likely to cause fatal accidents involving speed. 42 percent of speeding fatalities also involved alcohol. 31 percent of all traffic accidents involved alcohol. There were 9,878 drunk driving fatalities, which is approximately one fatality every 53 minutes. This is a 2.5 percent decrease from 2010. Approximately one out of every 173 licensed drivers was arrested for DUI. Young drivers (ages 15-20) accounted for 10 percent of all fatal traffic accidents with 4,247 fatalities. 32 percent of the 4,347 young drivers were intoxicated. The Insurance Research Council estimated that 13.8 percent of motorists did not have car insurance policies—about one in seven drivers. A recent poll showed frightening statistics about adult drivers and distracted driving behaviors. We've compiled several national holiday car accident statistics and Pennsylvania auto accident statistics. The number of highway deaths fell to 32,885 in 2010. It's the lowest number since 1949. Drivers traveled nearly 46 billion more miles in 2010. Fatalities decreased in most categories, with the exception of pedestrian accidents, motorcycle riders, and those involving large trucks. Fatalities in accidents involving drunk drivers dropped 4.9%. Approximately 10,228 people died. There were about 3,092 deaths in crashes involving distracted drivers in 2010. The National Highway Traffic Safety Administration (NHTSA) reports that 5% of drivers were seen talking on handheld cell phones. The NHTSA found that more than three-quarters of drivers are likely to answer calls on all, most, or some trips while driving. These drivers also admit to rarely considering traffic situations when deciding when to use cell phones. Most drivers said they are willing to answer a call or text while driving, but nearly all of these same drivers said they would feel very unsafe if they were a passenger in a car where the driver was sending or receiving text messages. Motorcycle deaths increased in 2010 to 4,502. Pedestrian deaths also increased to 4,280 in 2010. While fatal crashes decreased, the number of crashes involving injuries increased to 1,546,000 - an increase of 1.9%. More than half (51 percent) of those killed in crashes in 2010 weren't wearing a seat belt. Fatalities decreased in rural crashes by 6.7 percent, and increased in urban crashes by 0.3 percent. Thirty-one states, D.C., and Puerto Rico saw decreases in the number of traffic collision fatalities. Five states saw an increase. Pennsylvania was one of the states that saw an increase in fatalities. The number of deaths rose to 1,324 -- an increase of more than 5 percent. Other states with increases in the number of fatalities include Connecticut, Michigan, Indiana, and Ohio. In 2010, 87,949 people were injured in auto collisions. There were 121,312 traffic collisions in Pennsylvania in 2010. Deaths in auto accidents on Pennsylvania highways increased in 2010: 1,324 people were killed, which is 68 higher than in 2009. Speed-related deaths increased in 2010, jumping from 231 to 284. Aggressive driving-related deaths also increased from 130 to 168. Speed-related crashes were listed as the most common contributing factor in Pennsylvania accidents. Second was drinking drivers, and fourth was distracted drivers. Every day, there were 332 car accidents in the state (on average). One person died every seven hours in a car accident in 2010. Every day, 241 people were injured in traffic collisions. In 2010, one out of ever 44 people was involved in a car accident in Pennsylvania. Four people were killed every day in Pennsylvania traffic accidents in 2010. Of those who were injured in car accidents, 3,555 suffered major injuries. There were 3,163 crashes where the vehicle hit a deer. The highest number of crashes occurred in December (12,071). However, the highest number of deaths occurred in July (141). The highest number of accidents occurred on Fridays (20,739), while the highest number of deaths occurred on Saturdays (239). The highest number of collisions occurred between 3 p.m. and 3:59 p.m. (9,155). The highest number of deaths occurred between 4 p.m. and 4:59 p.m. In 2010, crashes involving alcohol decreased to 12,426, but alcohol-related deaths increased to 459. Thirty-one percent (31 percent) of fatalities in the 16-20 age group were drinking drivers. Half (50 percent) of driver deaths in the 21-25 age group were drinking drivers. This was an increase from 2009 (44 percent). On average, 34 alcohol-related crashes occurred in Pennsylvania every day. The approximate economic loss from traffic crashes in 2010 for Pennsylvania was more than $14.5 billion. The majority of car accidents involved hitting a fixed object. More than 550 (553) people died in these types of crashes. Male drivers were in more accidents than female drivers for every age group. The 21-25 age group had the most accidents at 28,524. Fifty-two people died in accidents involving snow, sleet, and freezing rain. In 2010, 915 crashes involved tire- or wheel-related vehicle defects. More than 58 percent of fatal car accident victims weren't wearing seat belts. The counties with the most reported traffic crashes were: Allegheny (9.3 percent), Philadelphia (9 percent), Montgomery (6.8 percent), Bucks (5 percent), Lancaster (4.2 percent), York (3.7 percent), Berks (3.8 percent), Lehigh (3.7 percent), Delaware (3.6 percent), and Chester (3.5 percent). Philadelphia had the most traffic-related deaths. The deadliest month for car crashes was August. Most crashes happened between 5 p.m. and 5:59 p.m. on weekdays, and between 2 p.m. and 2:59 a.m. on weekends. At any given moment, 812,000 vehicles were being driven by someone using a handheld cell phone in the United States. An average of four children ages 14 and younger were killed every day in auto accidents. Nearly 500 were injured daily. There were 121,242 reported accidents in Pennsylvania in 2009. Of those crashes, 1,256 deaths and 87,126 injuries were recorded. This is the lowest number since 1951. The economic loss due to auto collisions in 2009 was $1,086 to every man, woman, and child in the state. Every day in Pennsylvania there were 332 reportable traffic crashes, or about 14 every hour. Someone died every seven hours in 2009 in Pennsylvania in a car accident. Drivers ages 16 to 25 made up nearly 30 percent of all Pennsylvania accidents. About 75 percent of crashes occurred within 25 miles of home. Allegheny County had the highest number of reported traffic crashes of all the counties in the state. More crashes occurred in December than all the other months. More than 16,500 crashes took place around the holidays. Most occurred between Thanksgiving and Christmas. One out of every 44 people in Pennsylvania were involved in an accident in 2009. Anywhere from 85 to 90 percent of traffic crashes involved some sort of driver error. More than 32,000 speed-related crashes occurred in Pennsylvania in 2009. In 2008, the number of overall traffic fatalities reached a record low since 1961, and that number continued to decrease in the first few months of 2009. The number of car crash deaths in 2008, 37,261, dropped 9.7 percent from the number of deaths in 2007; this is the largest annual reduction since 1982. The 2008 passenger car occupant fatalities have decreased for the sixth year in a row, accounting for 25,351 deaths. This is the lowest number since 1975 when the NHTSA began collecting fatality crash data. Motor vehicle traffic crashes injured about 2.35 million people in 2008, which is the lowest number the NHTSA has seen since it began collecting injury data in 1988. In 2008, there were more than 5.8 million car crashes - 1.63 million causing injury, 4.15 million resulting in property-damage only, and 34,017 ending in death. There were 15,983 urban crash fatalities in 2008, decreasing 11 percent from 2007. Car accident deaths in rural crashes totaled 20,905, a 10 percent decrease from 2007. 41,059 people were killed in car accidents in 2007, an almost 4% decrease from 42,708 people in 2006. The highest number of deaths from car accidents occurred in July and the fewest in February. 17,725 fatalities occurred over the weekend and 23,237 during the weekday in 2007. In 2007, the highest number of fatalities, 6,796, occurred in the 25-34 age range while the lowest number, 470, occurred in the 5-9 range. 13,040 deaths in were linked to speeding. In 2007, 8,657 deaths occurred in intersections. About 23,482 deadly crashes involved a single vehicle while 17,577 involved multiple vehicles in 2007. Instances where the vehicle in a crash veered off the road led to 24,147 fatalities in 2007. Non-fatal car accidents totaled more than 5.9 million in 2007. In 2007, individuals were injured in about 1.7 million accidents, while around 4,275,000 crashes caused property damage only. Car accidents disabled 270,000 people in 2007. "2010 Motor Vehicle Crashes: Overview." National Highway Traffic Safety Administration. Dec. 2011. "Driver Electronic Use in 2010." National Highway Traffic Safety Administration. Dec. 2011. 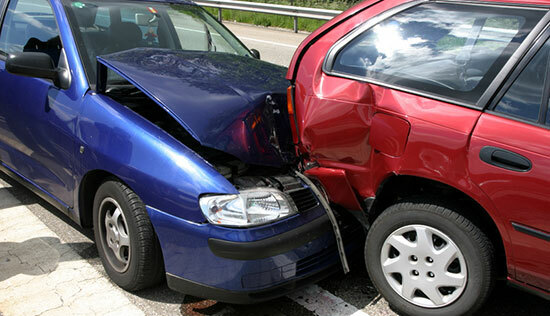 "2012 Motor Vehicle Crashes: Overview." National Highway Traffic Safety Administration. Nov. 2013. "Deaths From Traffic Accidents Drop 2.5 Percent in State." Pittsburgh Post-Gazette. March 16, 2012. "NTSB Advocates Brakes on Wrong-Way Driving." ABCNews. Dec. 12, 2012. "2013 Pennsylvania Crash Facts and Statisitcs." Pennsylvania Department of Transportation. Dec. 2013. "Traffic Safety Facts 2013." U.S. Department of Transportation. Dec. 2013. "2016 Pennsylvania Crash Fact and Statistics" PA Department of Transportation.